This absolutely brilliant early Qing dynasty bowl dates to a period called "Transition", during which the Ming dynasty was falling and the invading Qing dynasty had not yet taken full control over the south of China where the Imperial porcelain kilns of Jingdezhen was located. This situation meant two things. First of all - the ruling emperor could not, during the first 40 years of Qing rule, order any Imperial porcelain since he did not have access to "his" factory, and whatever was ordered was done so very cautiously. The second thing was that the Imperial factory because of this situation came out of touch with its most important - and only - customer; the Imperial Court in Beijing. In the face of this situation the most highly skilled potters had no other choice then to turn to the local Mandarins and the educated upper classes for their best porcelain. A new interesting and artistic high end porcelain thus came to be, produced without the formal limitations of the court taste. 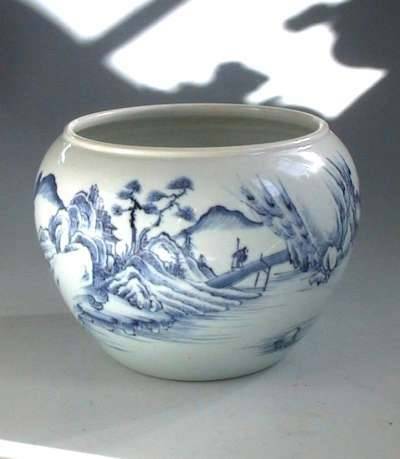 The Transitional period is artistically therefore one of the most interesting in the history of Chinese porcelain. One where artistic ambitions are combined with access to the best materials and the decoration is executed by the best artists now available. The personal taste of the potter, the 17th century Chinese customers, and today - the collector, are of the highest importance when selecting porcelain from this period, since there are by definition no reign marks to give you an indication of the importance of a piece. Regarding this bowl we recognize the powerful and solid shape from the Ming dynasty taste and notice that the fine and solid white clay body and glaze, almost "unctuous" to the touch, are of Imperial quality. Different from the previous periods the decoration compleately lacks limiting border lines, not even incised ones. The underglaze blue and white decoration is based on a contemporary horizontal silk painting depending on continuos Song landscape paintings in its monumentally conceived composition, its masterful draftsmanship and engrossing detail. The source of inspiration possibly being Wang Hui (1632-1717). In 1668 Wang Hui, until then "comfortable with his poverty" presented a hand scroll - his masterpiece to that date - to the influential connoisseur Zhou Lianggong (1612-72) who came to mention Wang Hui as "the greatest artist of the century" in his most influential book, the Tuhualu (Record of Painting) then being prepared. Zhou then introduced Wang Hui to his wide circle of friends, sought his paintings avidly, discussed and showed them to connoisseurs on his many travels and eventually catapulted Wang to national prominence and finally made him so famous that he in his old age was called to serve the Kangxi (1662-1722) emperor. Of Wang Huis style we recognize his study of the effect of light on form - its ability to clarify or obscure - and his pictorial rhythm in mixing light and dark, close and afar, high and low. Even if it is not possibly to ascribe the decoration of this bowl specifically to Wang Hui, the importance of contemporary art as a source of inspiration to first class porcelains of this period is evident. At least one masterpiece by Wang Hui is available at The Asian Art Museum of San Francisco, where also more information about this painter could be found.